Last weekend, when we ran out to Home Depot to get a refill for our gas grill in a fit of eternal optimism, I saw this pot of grape hyacinths. And I just couldn't resist. I know I say that about a lot of things. In fact, I probably have said that about most of the milk glass pieces you see here. Beautiful plant and the color with the white is stunning. Good choice. So Pretty! Perfect with the white. I'm sure glad you didn't resist! Lovely! I love how you couldn't resist-I find myself feeling this way a bit too often-where flowers are concerned! Your photography is of course incredible! Aren't these unusual flowers? I love them, too! Happy Monday! Is it just me or do you keep on getting better and better? Silly question because I already know the answer. These are magnificent, Mary. What lover of blue and white could have resisted? They are among my favourite signs of spring. Mary, some things are meant to be enjoyed, not resisted. If they can be shared here, even better. I love your photos, the drama and emotion they convey. I don't know how you do it, but am happy that it's what you do. I'm more than delighted that you couldn't resist! The grape hyacinths look fantastic against the milk glass! Just a beautiful crisp clean contrast. And seeing early spring flowers is such a bonus for me here in Florida, where there really aren't any...(trade-off for no winter)....they bring back great memories of our Oregon home and garden (hyacinths grow so well there!). Oh so lovely - the combination is stunning! Thanks for hosting. Love your grape hyacinths, such pretty contrast. 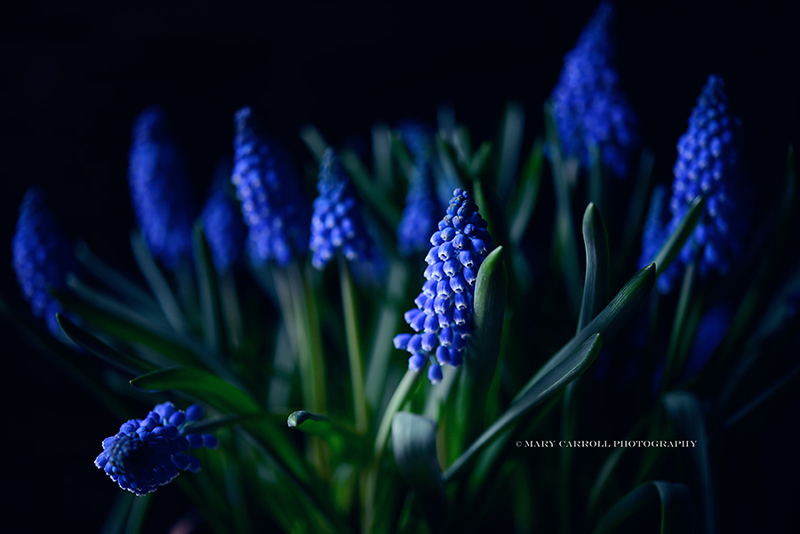 Oh Mary, Grape Hyacinths always make me smile, I really like them so much. Somewhere on these 2 acres, a few will soon begin to show themselves and I hope I can get a few captures. Saying that, I can already announce to you that none of mine shall be as fine as your shares this day. Just marvelous! The muscari against your milk glass creates a beautiful contrast and the flowers are small enough not to overpower the glass wear. Ours should be popping out any time now. I love it when my grape hyacinths bloom too. Thanks for hosting! 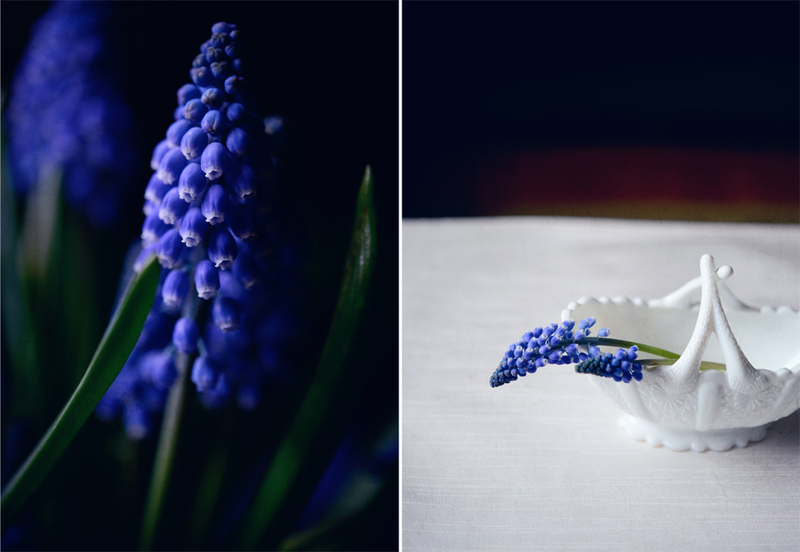 Your grape hyacinths are so sweet and I love the contrast against your milk glass. Thank you for hosting. Just gorgeous. I love Grape Hyacinths. Amazing photos. Your grape hyacinths are beautiful. 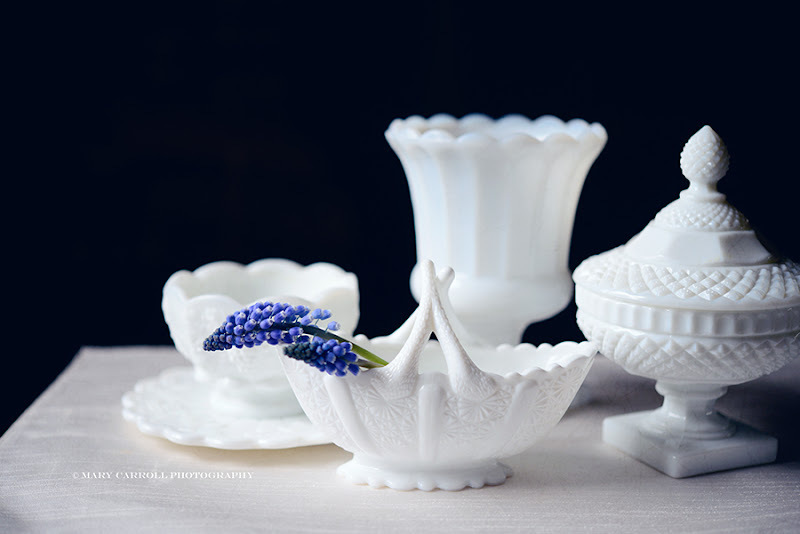 Stunning photos of the grape hyacinths with milk glass! Thanks for hosting. Oh my goodness Mary, I am beyond swept away. If that is lovely I don't know what is! Of course you couldn't resist, who can resist something blue,thin,elegant and that smells intoxicating? Gosh, that sounds like we are talking about a movie star! Well, these should be, they are prettier! Mary mary....could the blue hyacinths be any more beautiful!! What a gorgeous job you did in displaying them!! Happy Monday to you. 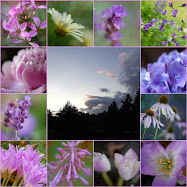 Mary, your photos are so lovely and ethereal, so delicate – I love them! Such a good choice with the blue grape hyacinths and the crisp white glassware. I am back with another mosaic, I did initially have a plan to do this quite often, but sadly haven’t had time, will try at least every other week from now on :-) Thanks for hosting! As usual, you photos are just gorgeous! Love the contrast between the blue, white and black. Simple and elegant. Hoping your garden is showing signs of spring! Yes Mary, taking pictures is what you do. And, you do it so well! Thanks for letting us share. I need to plant some grape hyacinths in my garden. I'm going to see if I can find some here at Home Depot. Thanks for hosting each Monday and for sharing your gorgeous images. They are such delicate, perfect flowers, Mary! I also love blue colored flowers--so rare and beautiful! I'm glad you do what you do. Lovely photos. Can I ask what you use for your dark background? It adds such an air of mystique that is reminiscent of old masters' still life paintings. Grape Hyacinths are truly one of my favorite first flowers of Spring. Today, I saw so many lawns filled with these tiny little purple pretties! Thanks for hosting and sharing! Mary what wonderful photos - the color and light is superb. Thank you again for hosting Mosaic Monday - I love it! Hi Mary, those Hyacinths are lovely, and I love the way you photographed them. Blue flowers are the best. Thank you for hosting and for such pretty pictures! I love your grape hyacinths. They look so pretty with your white milk glass. Such beautiful photos and thanks for hosting! So very pretty. Now to reclaim my breath.